Immunization averts an estimated 2-3 million deaths every year, providing protection from diphtheria, measles, pertussis (whooping cough), pneumonia, polio, rotavirus diarrhoea, rubella and tetanus. Yet, an estimated 22 million infants are not fully immunized with routine vaccines. There is an urgent need to better communicate the health benefits of vaccination and the dangers of not immunizing children. Over the last decade, the world has made major progress in the fight against malaria. Since 2000, malaria mortality rates have fallen by more than 25%, and 50 of the 99 countries with ongoing transmission are now on track to meet the 2015 World Health Assembly target of reducing incidence rates by more than 75%. A major scale-up of vector control interventions, together with increased access to diagnostic testing and quality-assured treatment, has been key to this progress. But we are not there yet. Malaria still kills an estimated 660 000 people worldwide, mainly children under five years of age in sub-Saharan Africa. Every year, more than 200 million cases occur; most of these cases are never tested or registered. A recent plateauing of international funding has slowed down progress, and emerging drug and insecticide resistance threaten to reverse recent gains. 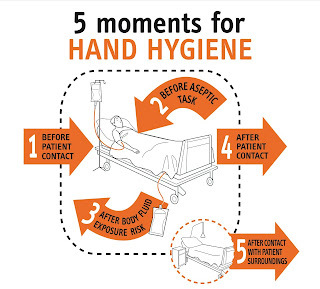 If you clean your hands after touching one patient and you touch another one immediately afterwards without touching anything else, you just need one hand hygiene action between the two patients.